As people around the world wish to stay healthy and young, everyone try their best to follow a well balanced diet. In order to build up a fair diet, people read magazines and books which give proper guidance of a health stay. 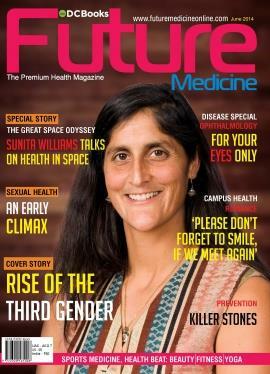 Among the number of periodicals available in the stores, 'Future Medicine' published by DC Media is a popular magazine which is emerging as a leader in its niche. Being one of the most celebrated periodical comprehensively covering global developments in the healthcare segment, Future Medicine gives prime focus to Asian countries keeping an eye on its emerging market. Giving credible, genuine and detailed news and views on the medical sector, this magzine is a companion for the people who care about their health. Articles on strategic breakthroughs, emerging trends, research reports and analyses and interviews with eminent doctors find place in various pages in the magazine. Columns by healthcare experts make this magazine the favouite among the readers.cHaving a wider readership with people from various walks of life, 'Future Medicine' is kept close to the soul by the medical community, top-level professionals, middle, high income groups, companies in the healthcare segment and pharma sector. It has also got readers among the policy-makers and the international community also. While evaluating the growth and performance of the medical system, 'Future Medicine' has a wider scope while staying as the backbone lending support to therapeutic world. As the magazine give the members of the medical community a platform to express their real concerns, it is well supported for its sincerity and reliability. Other prominent features of 'Future Medicine' are Sports Medicine, Health Beat, Beauty Fitness and Yoga. Time to time articles on heath care, Meditation, Wellness, Parenting, Food Therapy and Kids Fitness have influenced the life of many people. This family magazine is considered as a life support system. Fitness for Women, Positive Life and Family Health are some of the topics covered during the past.